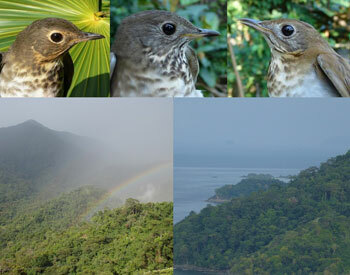 Three champions of long-distance migration, the Swainson’s Thrush, Gray-cheeked Thrush, and Veery, and their critical gateways into South America, the Sierra Nevada de Santa Marta (left) and the Darién (right) in northern Colombia. (September 17, 2014, The Auk: Ornithological Advances)—Northern South America is a geographic bottleneck that receives millions of migratory birds from North America every year, but very little is known about the migration ecology of species that winter in South America. Filling this knowledge gap is crucial for development of full-life cycle conservation strategies. As part of the long-term Crossing the Caribbean study, Gómez and colleagues compared the fall migratory strategies of three species of long distance migrants (three Catharus thrushes) at two major gateways to South America: the Darién and the Sierra Nevada de Santa Marta in northern Colombia. Birds that arrive through the Darién are believed to do so having followed a primarily Central American route, while birds arriving in the Sierra most likely do so after long-distance flights (>1,000 km) over the Caribbean Sea. As predicted, thrushes arriving in the Sierra were in poorer body condition than birds in the Darién, presumably reflecting the differing demands of over-water vs. over-land migration. However, the length of time that birds stopped over at each site, and the energy reserves they accumulated, was associated not just with their migratory route, but also with the distance remaining to each species’ winter destination in South America. Unraveling the breeding origins and wintering destinations of birds migrating through northern Colombia will be the next step to fully understand this hemispheric migration system and will be critical to identify sites and habitats that make the difference between a successful migration and an uncertain fate for these birds. See the open access article at http://www.aoucospubs.org/doi/full/10.1642/AUK-14-56.1.